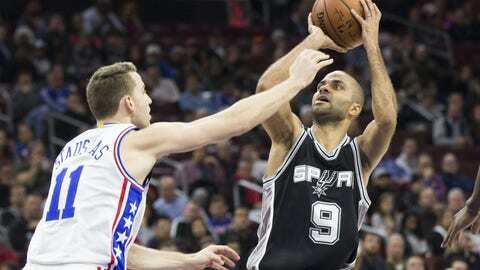 The San Antonio Spurs (37-11) will host the Philadelphia 76ers (18-30) on Thursday night. Here is how to watch this NBA game online. There are four NBA games on the slate for Thursday, Feb. 2. One of those games will be between the Philadelphia 76ers (18-30) and the San Antonio Spurs (37-11). Tipoff from the AT&T Center in San Antonio will be at 8:30 p.m. ET. The Comcast Network Philadelphia will carry the game in the Greater Philadelphia area. FOX Sports Southwest will carry the game in the Greater San Antonio area. Since this game will not be nationally televised, the available live stream for this game can be found on NBA League Pass, which requires a subscription. Philadelphia enters play at 18-30 on the year and in 13th place in the Eastern Conference. The 76ers trail the Boston Celtics (31-18) by 12.5 games in the Atlantic Division standings. Philadelphia lost its most recent game on the road to the Dallas Mavericks on Wednesday night, 113-95. The 76ers have gone 6-4 in their last 10 games and are 6-15 away from the Wells Fargo Center this season. San Antonio enters play at 37-11 on the year and in second place in the Western Conference. The Spurs lead the Houston Rockets (36-16) by three games in the Southwest Division standings. San Antonio won its most recent game over the Oklahoma City Thunder on Tuesday night, 108-94 The Spurs have gone 7-3 in their last 10 games and are 17-6 at the AT&T Center this season. According to OddsShark.com, the Spurs will be laying a staggering 15 points at home to the visiting 76ers. The associated moneylines for this game are San Antonio -2,500 and Philadelphia +1,100. This game’s over/under comes in at a combined 211 points. While 15 points is a huge point spread, look for the Spurs to win and cover over the 76ers on Thursday night. Philadelphia is improving, but not quite good enough to win on the road in a place like San Antonio.